IVYBRIDGE have moved up to 10th in the South West Premier League after an impressive 49-26 home win over fourth-placed Maidenhead on Saturday. The Bridgers had been annoyed that Maidenhead had complained about the postponement of the original match back in January due to a waterlogged pitch. Although Maidenhead were not awarded the win as they had hoped, Ivybridge were docked five points for failing to follow the correct protocol for postponing a game. That dropped Ivybridge into the relegation zone, which upset the Cross-in-Hand club’s players. But they channelled their frustrations into Saturday’s game and regained the five points they had lost. “We don’t want to talk too much about what happened,” said Ivybridge captain Matt Finn. “But we just wanted to get those five points back. “It was such a good performance. But we still butchered some tries. We could have scored even more, but you can’t really pick holes in it when you have won by so much. That would be over critical. Ivybridge now want to build on Saturday’s victory. In a tight league they are level on points with 12th placed Weston-super-Mare but only five points behind seventh-placed Camborne with six games to go. Billy Pinkus led the way for them on Saturday with a hat-trick of tries, with two coming in the first 15 minutes. His younger brother, Mitch, also kicked eight points as Ivybridge went 18-0 up. That was increased to 23-0 when scrum-half Ben Watts scored. Maidenhead did get a try back just before half-time. The teams traded tries early in the second period before Ivybridge went 42-14 ahead, with Billy and Mitch Pinkus both going over and Watts adding a second. Maidenhead did come back with three more tries, but the last word went to Ivybridge with player-coach Lewis Paterson scoring. Mitch Pinkus finished with four conversions and two penalties to go with his try. 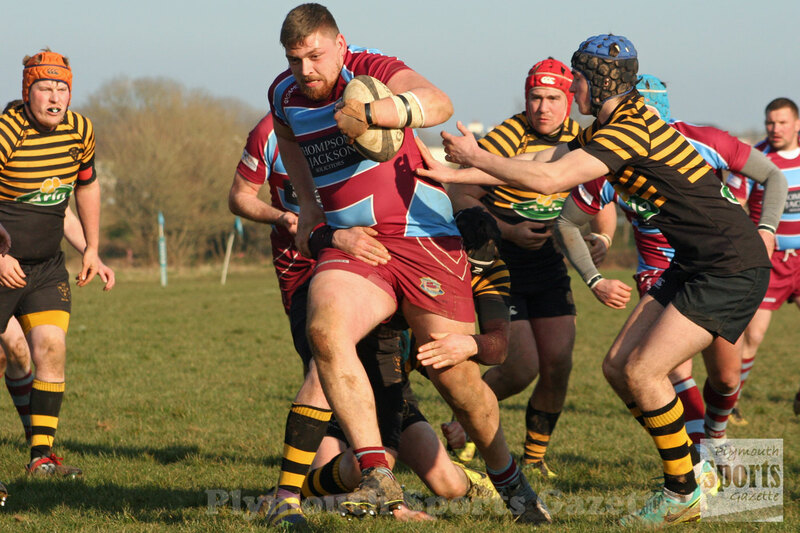 DEVONPORT Services suffered back-to-back defeats for the first time this season when they were beaten 12-10 away at Kingsbridge. The loss, which followed on from a narrow 12-8 reverse at Falmouth the previous week, means Services are going to have a major fight on their hands for runners-up spot now in the league, having had hopes of the title earlier this month. They stay third in the table, one point behind second-placed St Austell and 11 behind St Ives, but now they have played the same number of games. 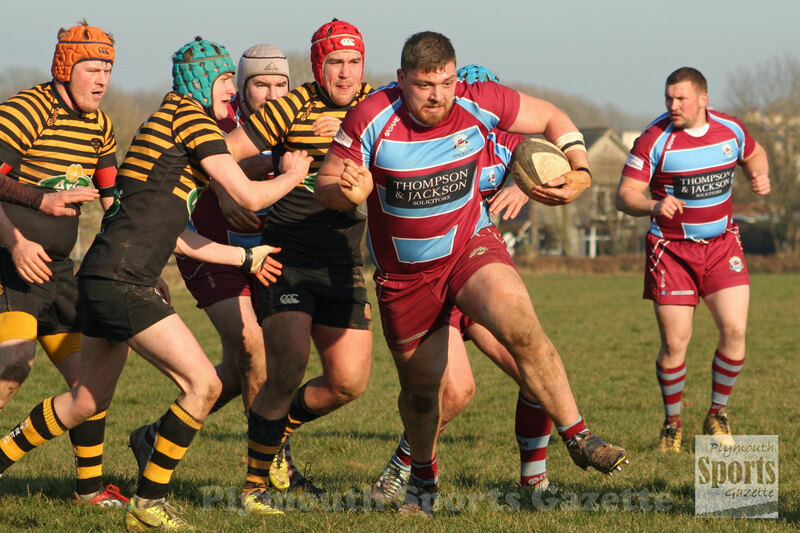 Kingsbridge are up to fourth after Saturday’s success, but they are 11 points behind Services. Having finished third last season, Devonport want to make sure they at least claim the runners-up spot and a play-off place this time around. It didn’t look like they would have too many problems at Kingsbridge on Saturday when they went 10-0 up after just 10 minutes. However, they could not build on that start and in the second half Kingsbridge got on top. “It was the proverbial game of two halves,” said Services team manager Kieran Leach. Services made a great start with Matty Anstis kicking a penalty and then fit-again Matt Gregory scored a try under the posts following a scrum. Anstis converted to make it 10-0. That was how it stayed until half-time, but then Kingsbridge got back into it and scored two tries to take the win. “It was another disappointing result to follow last week,” added Leach. SALTASH retained the South West Counties’ Senior Vase title by beating Somerset Premier Division leaders Gordano 32-21 away on Saturday. The Ashes will now face Slough at home in the South West Divisional final on March 17 for the chance to move another step closer to Twickenham. There was nothing between them and Gordano on Saturday until really the final quarter of the match when the visitors finally pulled away. Saltash made a great start and went 12-0 up with a catch-and-drive try by Lewis Wells and then a touch down from James Moriaty, which Kieran Down converted. But Gordano hit back and went 14-12 ahead with two converted tries before Down kicked a penalty to edge the Ashes back in front before half-time. The hosts went 21-15 ahead after the interval before Saltash’s fitness told and they ran in three tries in the final 25 minutes. The first came from prop Adam Coutts following a tap penalty. Ollie Mulberry was next to go over before captain Ryan Rayner sealed the victory with their fifth of the match. Saltash’s success in the RFU Senior Vase means they will have to reschedule their Cornwall/Devon League match with Torrington. They remain third in the table, but do have games in hand on both Wellington and Penryn. 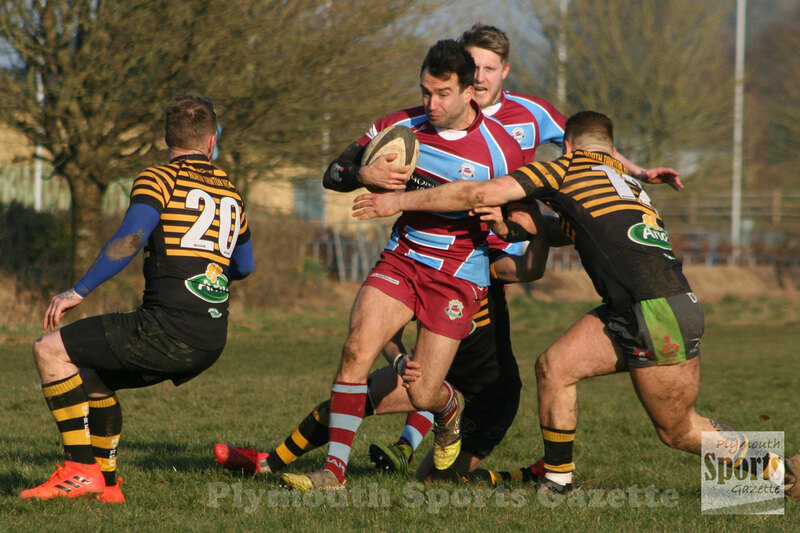 Wellington took over as the new leaders of the division after beating an under-strength Plymouth Argaum side 64-7. Argaum, who had won three of their previous four matches, really struggled to get a side to travel to Somerset. At one point on Saturday morning it looked like they were going to hand their opponents a home walkover. However, after a lot of effort they managed to get 16 registered players to make the trip and they battled hard but Wellington just had too much for them. The hosts ran in 10 tries – five in each half, seven of which were converted. However, Argaum always kept going and were rewarded with a late try by Chris Langley, which John Fulton converted. JAMES McFARLANE scored a last-gasp try for Tamar Saracens against New Cross which may just guarantee the Ernesettle-based club their Devon One status. The prop struck with the last play of the game to give Sarries a 24-19 home win over their Kingsteignton visitors. It was his third try of the afternoon and it lifted his club out of the bottom two for the first time this season. The only way they could fail to stay up now is if they were not able to win any of their three remaining matches and either Exeter Saracens beat leaders South Molton next weekend or Old Techs win their two remaining matches – the final one which is against Sarries. Techs have given themselves faint hope of staying up after claiming their second consecutive win with a 40-22 success over Exeter Saracens. Tamar Saracens started well against New Cross, who are still not mathematically safe themselves, and went 12-0 up in the first 20 minutes, but the visitors hit back. The game was tied at 19-19 going into the closing stages with McFarlane grabbing two tries for Sarries and Mike Cox one and Tom Rigby kicking two conversions. But with the points looking like they would be shared, McFarlane popped up again to score. Meanwhile, Techs really found their attacking form in their 40-22 victory over Exeter Saracens at Weston Mill. They ran in six tries, with winger Joel Dickin scoring three of them. Their others came from Joe Bailey, Matt Simmonds and Eddy Ramazani. Billy Evans, having a good day with the boot, added five conversions. The only disappointment for Techs was that Exeter grabbed a try scoring bonus point with the last play of the game, which keeps them six points ahead of them in the table. “We played well again,” said Techs coach Shaun Bedford-Smith. “We are playing some good stuff, which is enjoyable to watch. We are getting the ball wide and the off-loads are good. But all Bedford-Smith and Techs wanted before the match was just a win of any kind. Had they lost on Saturday they would have been relegated. They must now beat Totnes next Saturday and see if it will all come down to a big match against Tamar Saracens on the final day. “It’s just nice that we are starting to perform. You can go one of two ways when you are losing all the time – you can just sink or you can swim – and we are swimming now and giving it a go. OPMs face another season in Devon Two after narrowly losing 8-5 to North Tawton at King George V Playing Fields. The Old Boys had to win the game and deny North Tawton a bonus point to secure a top two finish and claim promotion. They made the worst possible starts, giving away a penalty in the first minute and then gifting their opponents a try 12 minutes later by trying to pass the ball on their own 22. But then after that they dominated territory and possession. They got themselves back into the game when Billy Garratt scored from a catch-and-drive move on 17 minutes, but that turned out to be all they could manage as North Tawton defended heroically. OPMs, who did have the upper hand at the scrums, just kept either making the wrong decision or making mistakes when they got into the 22. As well as a conversion, they also missed a penalty and dropped the ball right on the try line in the second half. It was the second season running OPMs had finished third in the table. Afterwards captain Henry Matthew said: “It is hugely disappointing, but fair play to them (North Tawton), they defended really well. “I think at the end of the day, they deserve that promotion. “We threw everything into it, but just made a few bad decisions and a few bad mistakes and ultimately they’ve won the game. “It just didn’t happen for us. But ultimately if you are going to go up you have to win all your games through the year. We should have really won up at their place, but they are a much better side now then when we played them before. Plympton Victoria are certain of a top five finish after claiming what is believed to be a club record 106-0 win over an under-strength DHSOB side at Marsh Mills. Sam Stockdale and Jordan Mitchell both claimed memorable milestones in the game. Stockdale, back in the team following suspension, scored six tries, while Mitchell claimed a personal tally of 46 points from three tries, 14 conversions and a penalty. 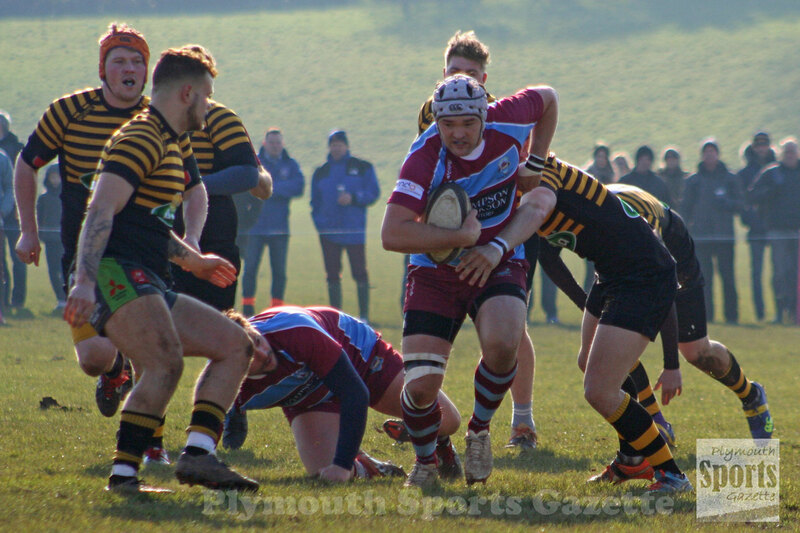 Plym Vic had an afternoon where everything went right for them and they were 77-0 up at half-time. As well Stockdale and Mitchell, Plym Vic had Mike Hagan scoring two and Mark Hart, Jamie Haigh, Tom Gill and Jason Cleverley also touching down. “Everything we did went well,” said Plym Vic’s Chris Hunt. “Everything just seemed to work for us – every pass went to hand and every bounce of the ball fell for us. We made good space on the outside where they lacked numbers occasionally. “I cannot remember us claiming a score like that in a friendly, cup or league. I don’t think we have every turned in a performance like that. St Columba & Torpoint also battled hard but could not stop Buckfastleigh from winning promotion by winning 62-5 at Definance Field. 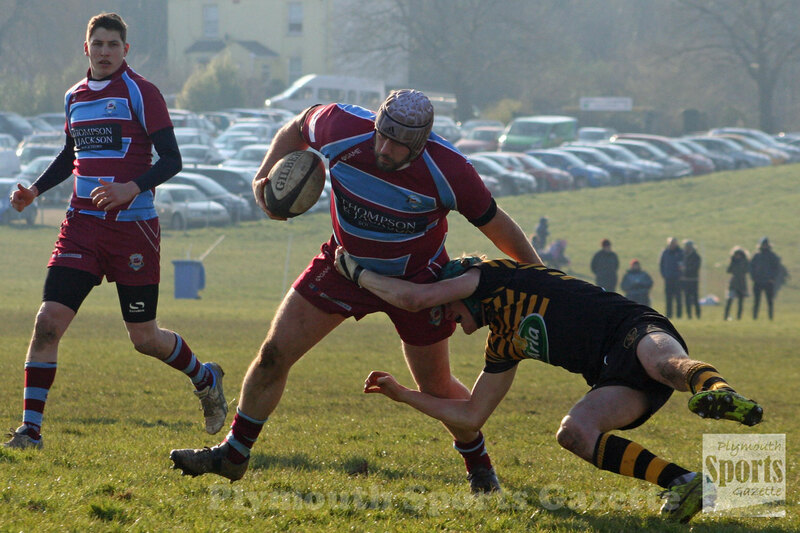 Buckfastleigh finished second, one point behind North Tawton.